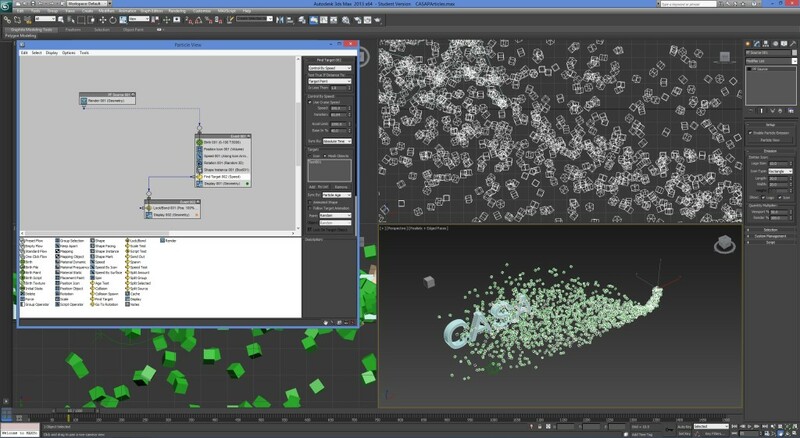 Particle Flow is a versatile, powerful particle system for Autodesk’s 3ds Max. It employs an event-driven model, using a special dialog called Particle View, allowing you to combine individual operators that describe particle properties such as shape, speed, direction, and rotation over a period of time into groups called events. Each operator provides a set of parameters, many of which you can animate to change particle behaviour during the event. As the event transpires, Particle Flow continually evaluates each operator in the list and updates the particle system accordingly. To achieve more substantial changes in particle properties and behaviour, you can create a flow. The flow sends particles from event to event using tests, which let you wire events together in series. A test can check, for example, whether a particle has passed a certain age, how fast it’s moving, or whether it has collided with a deflector. Particles that pass the test move on to the next event, while those that don’t meet the test criteria remain in the current event, possibly to undergo other tests. The simple example pictured above details a pFlow dialogue determining the birth of particles linked to a target geometry. The particles can subsequently be baked (using pFlow Baker) into an animation timeline for simple output via .fbx, allowing import into external systems such as Unity or Lumion. The clip above illustrates the pFlow system imported into Lumion with the addition of a scene created in CityEngine.